Getting your koi to grow to the largest jumbo size is often a challenging task and is always an ambition deep in the mind of every hobbyist. Imagine seeing a fat koi carp with sturdy and thick body mass and yet so colorful, swimming around in your pond as it creates a stunning looking view. However, getting your fish to achieve their maximum size using only natural methods without any growth hormone requires a lot of commitment and dedication and like the Japanese always said, discipline is the key. Koi carp with proper care is provided naturally can achieve more than 2 feet in length and depending on the variety and nutrition given, can weigh over 30 pounds and that is an extreme gigantic size. I remember seeing one at a show competition that is so huge with the body width so wide and heavy and as it swims the around, the movement is not in any way affected by the bulkiness but instead projects a graceful and elegant flawless movement. Now, everyone should be excited with the prospect of seeing their favorite fish achieving that kind of standard as it will be a proud achievement for everyone into this hobby and will do anything possible in order to get that. But before we jump in further, let us try to understand what are the factors involved including the ways that we can do to get our pets achieving their maximum size. Genetic is the main factor that determines the optimal growth size. Most of the time, it is not possible to find out their true bloodline because some koi sellers that import the fish might not have so much information pertaining to the parentage of the fry. If you get the chance to visit Nishikigoi breeders in Japan and buy directly from the suppliers there, then most probably there’s a high chance for you to record and trace whether the fish has true potential based on to their lineage. To sums it up, Chagoi which is a copper color variety is the biggest among all, similarly as with the other outcrosses of the fish. Females in general are also bigger to certain extent compared to males but this is not always true. However, if you have a breeder stock which you would like to maintain the necessary traits and then get giant breeds, you can always work on handpick by doing artificial selection to single out the fastest growth fry and develop them to their optimal growth potential (read up about koi selection for breeding). Thus, it is a very tedious task that might take a long time process to get it right and all this information has to be properly recorded for traceability purposes. By doing a proper record keeping, out crossing between koi varieties will have better to chance to develop a genetically larger fry. Nutrition plays an important role towards how big they get. Put aside the genetic factor, if you have a koi that carry the genes that dictates high growth, it won’t get any further towards its true potential if the right food is not given. Basically there are quite a number of high quality koi pellets in the market, notably Dainichi, Hikari, Hai Feng, Nishikoi Wheatgerm and if you prefer giving medicated foods, you can try Medikoi as well. Dried pellets alone is actually not enough, personally I’ve known a hobbyist that provide beef heart combined with occasional feeding of live shrimps as a supplement to get them to put on weight. Some koi experts which I’ve talked to totally put a blanket ban and avoiding feeding of live blood worms because those are notorious of introducing disease that will make your fish sick and jeopardize their growth potential. Basically if you have time to try out your own recipe developed at home you can grind up wheatgerm paste with eggs plus spinach, and then add some pet vitamins to the mixture. Finally your feeding schedule should be adjusted to provide constant small amount of foods instead of one large meal which will cause them to feel bloated and the foods not properly digested before discharged. You will know that your koi is ready for the next meal when they start to get excited swimming around begging for foods. Next is Environment. 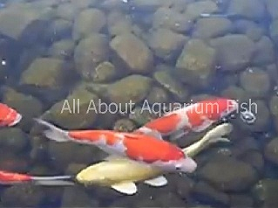 Koi can only attain their maximum length and size only if the environment in which they live in is right. Based on research, it was discovered that koi naturally will release some kind of hormone into the water and the more concentrated the level gets, this will inhibit further growth to your fish. All these facts sound logical to me because similar as their wild carp cousin fighting for survival in the wild, they must attain the proper and right body mass that balances itself with the environment that they live in which can support and sustain their population. Therefore it is very important that the water must be constantly replaced with a fresh, oxygen-rich water (rather than recycled water from pond filter system) to get them on the right track on their growth chart. Similarly as the pond becomes too crowded due to overstocking issue, the fish will generate a lot of waste especially ammonia which will create a toxic condition that pollutes the water that can cause problems with their health. Comparing between outdoor and indoor ponds, basically there are certain advantages with outdoor setup because temperature can be slightly higher and exposure to sunlight also plays a main role that ensure the UV will help in their coloration and maintaining the growth curve. However, if you have the luxury of space enough to accommodate both outdoor and indoor ponds (usually using poly tanks), that would be better because it will provide a certain advantage to have them kept indoors during winter season and avoid complete hibernation. In places where there is large area for creating mud ponds, that is considered one of the best option available and the main explanation why mud ponds are better is the availability of live foods and the minerals present in the mud itself.